What Is Sugar Soap Used For? Sugar soap packs a punch when it comes to removing greasy, grimy buildup in garages and around the house. It's a common cleaning product in countries such as Britain, Australia and France, but it's not popular in the United States. The closest U.S. equivalent is trisodium phosphate, also known as TSP. Despite the name, the common form of sugar soap contains no sugar. The name comes from the way it looks: The powdered form resembles sugar crystals. Although ingredients vary from brand to brand, the main ones are sodium carbonate, sodium phosphate and sodium silicate. Some products labeled as sugar soap in the United States actually do contain forms of sugar. Most of these are for personal care and are not the same cleaning product offered in the United Kingdom, France, Australia and beyond. 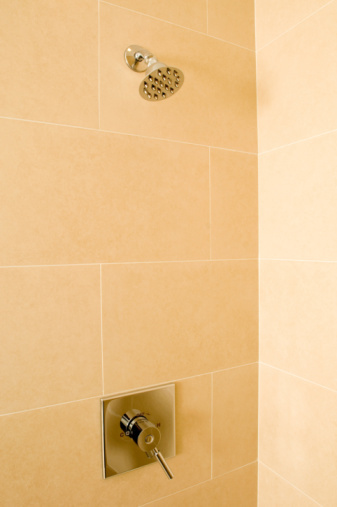 Sugar soap excels at cleaning walls to prepare them for wallpaper or a fresh paint color. Mix 1/4 cup liquid sugar soap into 5 quarts water in a bucket. Wipe the walls down with a sponge dipped in the solution, working from the top of the walls down. Wear rubber gloves as you work. Open the windows or turn on fans to speed up the drying time. The powdered form of sugar soap serves as a handy cleaner in the bathroom. Sprinkle a little powder into the toilet bowl, then sprinkle more on a damp cloth. Wipe down sinks, the tub and shower stall with the cloth, then rinse the cleaned areas thoroughly. Once the powder sits in the toilet for an hour, flush the toilet or use the scrub brush to remove stains before flushing. Wipe down dirty appliances, patio furniture, countertops and even tile with a homemade sugar soap spray. Mix 1/8 cup liquid sugar soap into 2 liters of water in a bucket, then pour the blend into spray bottles. Spritz the areas you're cleaning, wait a few minutes, then wipe down with a damp cloth. Rinse the cloth regularly as you work. You can use the same mixture to wash vinyl, tile, laminate and wood floors. Just leave it in a bucket instead of putting it into spray bottles. Mop the floor with the solution, then again with water only. Test the solution on an inconspicuous area before mopping the entire floor. 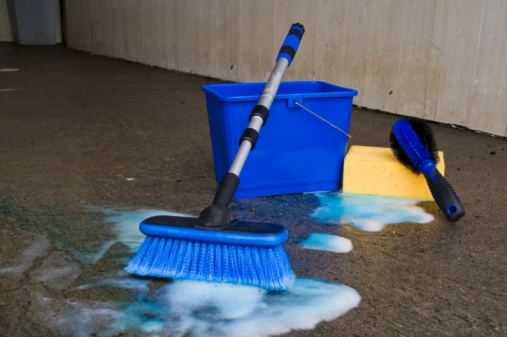 Sugar soap powder helps lift those greasy oil spots staining a garage floor. Sprinkle enough powder to cover the spots completely. Drizzle water over the powder, wait 30 minutes, then scrub the powder with a stiff broom. You can use the liquid version straight out of the bottle. Pour it on top of stains when you are scrubbing with the broom or a stiff brush. Rinse by mopping with clean water. Sugar soap can dry out the skin, so wear rubber gloves while working with the powder or liquid. Wear a dust mask when using the powder to prevent inhaling it. Wash your hands thoroughly and avoid touching your face or rubbing your eyes if you've gotten sugar soap on them.